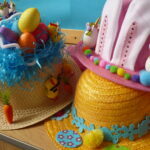 A huge well done to all the children who took part in the Easter Bonnet Parade on the final morning of the Spring Term. It was obvious a lot of hard work had been put in at home and the children looked fantastic! Many thanks to Mrs Cunningham for organising the event and Father David for helping us judge the winners!